Wooden Dummies make awesome gifts! The holidays are here. Use Black Friday and Cyber Monday to find killer Wing Chun gear, books, videos, weapons, and swag for yourself or a training buddy, and save some money! Can't think of the perfect gift for a loved one? **This page was updated Monday, December 8 at 14:00 PST. Check back often over the next few weeks for updates on discounts and special promotions for the holidays! 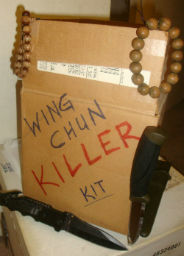 The website Everything Wing Chun has it all if you really want to make a Wing Chun statement. You can buy yourself, or your sifu, or training buddy a pair of Butterfly Swords or a wooden dummy [link]. And if you prefer a little lotus gift rather than a Big Buddha one, you can also find things like Die Da Jow, wall hitting bags, rattan rings, and much more. You can even get gift certificates to make purchases later (like for an upcoming birthday). Check Out All the Wing Chun Gear You Want! Butterfly Swords (select models) - Find metal ones, sharp ones, and plastic training ones, too. Wall Hitting Bags - Train your straight punch. Make sure you have mass and momentum behind your chain punches. Dit Da Jow - This is great for sores, bruises, and aches. And probably better for you than pain medicine. Books - You can even search by sifu. DVDs - You can also find rare, foreign language versions. Dragon Poles (select models) - Kill them from faraway. Training Rings - Many people love how these help you train your structure and how to protect your center. Wooden Dummies - by MasterPath or Buick Yip, even Teak. If you want to learn and improve your skills, then you'll love the downloadable DVD library available through WingChunLife.com's 'Video MASTERY'. When it launched in the summer of 2013, the collection only contained about 300 titles. Today it has almost 600! Want to improve your footwork or your bil gee? You'll find a video to help you do that, and more. Baat Cham Dao DVD Download! Master Taner Erdogan and Master Graziano Di Giorgio recently released their Butterfly Sword video! During the holidays, you can't just buy stuff for yourself. You have to get a few things for friends and family, too. So I included Amazon because you can find great Wing Chun and martial arts gifts for yourself, AND non-martial arts gifts for friends and family, too. One problem with Amazon is its so big and huge, and offers so much, it is sometimes hard to find what you want. You can get a free 30-day trial of Amazon Prime here. When shopping online, you'll enjoy how Amazon Prime, even your Free, 30-day trial, will save you money, and send your gifts fast with free 2-day shipping! Claim your FREE trial membership and get gifts shipped in 2-days, for no charge. Some things are hard to find. But Amazon seems to have many of those hard to find items you've been looking for. Use this link to get started, and find unique Wing Chun gifts on Amazon. If you're like me, it's hard to think what to buy people. So I've organized a few links to help you buy the perfect gift. Find Great Gifts for Your PETS! And what do you do if you still can't find the perfect gift? Get them a gift card, and let them figure it out. Between these three gift options, you can find literally anything. From Wing Chun to Pets. Remember to check back in a few days and for the next couple weeks to grab all the available holiday deals!